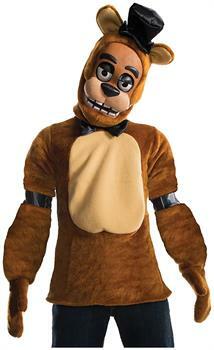 Turn your son into a man-mangling murderer with a Freddy Fazbear Costume for boys! This Five Nights at Freddy's costume features a Freddy mask with his creepy brown bear face, light brown ears, and black top hat. The plush top features brown sleeves, a light brown chest, and a black bow tie. Complete Freddy's not-so-cuddly teddy bear look with the brown bear mittens, and your son will be ready to prowl the pizza parlor! Shoes and pants not included.